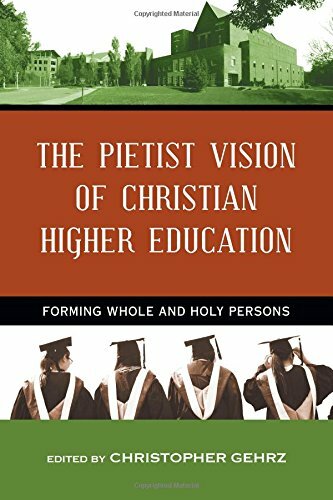 When I first set out to read The Pietist Vision of Christian Higher Education: Forming Whole and Holy Persons (henceforth The Pietist Vision) I had my apprehensions. To put it bluntly, I am not a fan of Pietism. But even as an “anti-Pietist” I enjoyed large sections of this book. You might be asking why I even wanted to read and review this book if I’m opposed to Pietism in the first place. I do believe Pietism errs in some serious ways, however, its emphasis on formation is something that even an ardent opponent can and must appreciate. The Pietist Vision is a collection of fourteen essays divided into four parts spanning a large scope of topics. The unifying theme is, as the title reveals, how a Pietist understanding of the Christian faith informs Christian higher education. Part Two shifted from the internal dynamics of the “Pietist University” to examine the ways that Pietism interacts with the world outside. This section particularly examined the ways in which the Pietist university might train and bring up its students so that they might interact with the outside world in a loving and winsome way. These essays frustrated me due to their, openly, Pietist assumptions. The Pietist assumptions that undergirded these essays where that Christians occupy another world from non-Christians and that our interactions with non-Christians are tantamount to intergalactic communication (maybe that’s an over exaggeration on my part). In my opinion these essays exemplify the portions of Pietism that I am most prone to push back on. Parts Three and Four of the book consisted of essays that emerge as a form of dialogue within the world of Pietist higher education. The two essays in Part Three brought in some thoughts from the world of the natural sciences while the four essays in Part Four offered proposals for practicing the broader vision of Pietist higher education in parts One and Two. These chapters are less accessible to the reader in some ways because they assume a conversational tone for readers already immersed in the world of Pietist higher education (of which I am not). In the end The Pietist Vision is a book for a specific audience. I would not count myself out of this audience, particularly insofar as the first two parts of the book are concerned. Readers who are interested in the application of a Pietist understanding of the Christian faith to higher education will undoubtedly gain much from this work. Likewise, readers (like myself) who are interested in all Christian expressions in education can glean much from The Pietist Vision, especially the first two parts. However, those would-be readers who do not fall into one of these categories might find themselves sitting in on a conversation they are neither interested in nor understand.